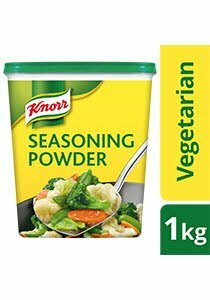 Knorr Vegetarian Seasoning Powder is made with selected spices to enhance your vegetable dishes. It is perfect for seasoning vegetables, rice and noodles. Salt, Monosodium Glutamate, Lactose (Milk Derivative), Cornflour, Maltodextrin, Sugar, Hydrolyzed Vegetable Protein, Soy Sauce (Contains Wheat), Palm Fat, Spices, Sodium Inosinate and Guanylate. All Food Additives Used Are from Plant Origin. Made on equipment that also makes products which contain cereals containing gluten, fish, crustacean, egg, mollusc, peanut and tree nuts. For Stir-Fry: Sprinkle desired amount of Knorr Vegetarian Seasoning Powder to improve flavour and taste of your dish. For Stock: Dissolve 20g (2 heaped tablespoons) of Knorr Vegetarian Seasoning Powder in 1 litre of boiling water. Close lid tightly and store in a cool and dry place.